A ride down the Sunset Strip is a trip past a diverse range – some might say a hodgepodge – of architectural styles: A Loire Valley chateau, a rustic roadhouse, an Art Deco masterpiece, a lime-green Oscar Niemeyer spaceship, a Googie diner, a double row of updated Georgian shops, a Spanish Colonial liquor store, steel-and-glass towers and everything in between. But even among the Strip’s polyglot vernaculars, the Piazza del Sol at Queens Road and Sunset stands apart. Its Venetian Renaissance Revival façade makes it the only neo-classical building on the boulevard, and it is by far the Strip’s most ornate structure. The Piazza’s size – four floors of livable space atop a street-level garage – and the way it fully occupies the property’s footprint give it a palatial grandeur found nowhere else on the Strip. The building’s story also makes it unique. Local lore has it that it was once a bordello, a lavish pleasure palace, that serviced Hollywood elites in the 1930s. While this is not entirely true, it was the scene of a sensational murder in 1935, and Rod Stewart was carjacked there when he owned the building in the early ’80s. It was nearly destroyed by an arsonist in 1983, was later restored, and has been a popular business address for film companies ever since. 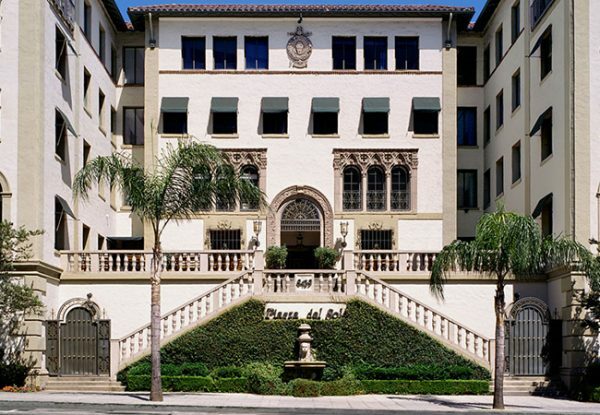 Built in 1927, the Piazza is older than its nearest historic neighbors – predating by two years the Chateau Marmont and by four years the Sunset Tower – both of which, like the Piazza, were originally apartment buildings. And like the Sunset Tower, it was listed in the National Register of Historic Places after being marked for demolition in the 1980s. But a check of the Piazza del Sol’s listing in the National Register reveals a quirk in the record. The Register shows its original name as Hacienda Arms Apartments, not the Hacienda Park Apartments – a name that in 1927 connected the building to the neighborhood around it, Hacienda Park. It’s by no means a fatal error, and the rest of the information appears to be correct, but this small mistake has been magnified over the years – picked up and repeated in dozens of articles and books, including, for example, the headline of the building’s Wikipedia page. The announcement in late 2018 that the owners of the Piazza del Sol plan to convert it from an office building into a hotel has brought long overdue attention to this historic gem. In what follows we’ll trace the building’s history, review some of the notorious goings-on there and revisit the devastating fire that led to the quirky mistake about its name as well as its extraordinary rise from the ashes. In 1926 Alexander R. Gallos bought a commercial parcel on Sunset Boulevard in Hacienda Park and began construction on a high-end apartment building. The architect was Charles Sherman Cobb, whose roster included numerous residential and commercial buildings in Toronto. The Hacienda Park Apartments opened in early 1927. The cost upon completion was $382,000 (about $5.5 million today). The Hacienda Park was ahead of trends in construction of high-end apartment housing west of Hollywood. It was built around the same time that the Garden of Alla residential hotel opened on Alla Nazimova’s former estate a half-mile east on Sunset, and perhaps a year later than the Normandie Village Apartments a block to the west. While both the Garden and the Normandie Village were demolished in the middle of the 20th century, more than 20 of the buildings constructed in the area between 1926 and 1931 are still in use, including Colonial House (1930) on Havenhurst, the Granville Tower (1929) and La Fontaine (1928) on Crescent Heights Boulevard; and Patio del Moro (1926) and El Palacio (1931) on Fountain Avenue, to name a few. Like many of its peers, the Hacienda Park was a full-service building. It had a full-time staff that provided switchboard, housekeeping, laundry and other services. It was managed by Mr. and Mrs. Arthur E. Hamilton who controlled other high-end properties, including the Del Tahquitz Hotel in Palm Springs (demolished in the 1960s), the Regent near MacArthur Park (demolished in 1983) and the El Cortez apartments in San Diego (still standing). On Nov. 30, 1930, a business news item in the Times announced that the Hacienda Park had been leased by Consolidated Hotels Inc., a newly established, Los Angeles-based chain that managed and provided services for 125 hotels and apartment buildings in the region. Despite the nationwide economic collapse in the Great Depression, business along Sunset Boulevard seemed to bustle. A dozen or more nightclubs, cafes and shops catering to the Hollywood crowd opened in the early 1930s. The Hacienda Park was home to quite a few movie people in its heyday. Most notable of these were Loretta Young, one of the biggest stars in the golden age, who lived there during her short-lived first marriage to Grant Withers; Jeanette MacDonald, a leading actress and singer whose operatic style was in vogue in the early 20th century; and character actress Marie Dressler, who had a late life career resurgence playing formidable matrons in MGM comedies and dramas. Many of the tenants were wealthy people who had no connection to the movies. One of these was Ada Wharton, the widow whose adopted son, dress designer Paul Ivar Wharton, was murdered there in April 1935. The story – which we covered here – put the Hacienda Park in the national spotlight. Around the time the Wharton murder was playing out, Phil Goldstone, the chief studio executive at Tiffany Pictures, acquired the Hacienda Park. Goldstone had amassed a small fortune during his tenure at Tiffany, one of the “Poverty Row” studios, and in the mid-1930s was investing in real estate. In April 1937 he bought the famed – though by then vacant – Alexandria Hotel for $300,000 (about $5 million today). Located at Spring and Fifth streets, the Alexandria had been a favorite stopping place for the movie crowd in the early days. Goldstone announced plans for a $1 million renovation and upgrade – about $17 million today – to revive the old building. Just four months after that ad ran the building was in the news when it became associated with the scandalous arrest of one of its most notorious residents, A-list Hollywood madam Lee Francis. (We’ll cover Francis’ story in detail in a subsequent story.) During the trial her defense attorneys accused vice detectives of entrapment, claiming they had listened in on Francis’ phone calls in her apartment at the Coronet. Phil Goldstone sold the Coronet in November 1941. 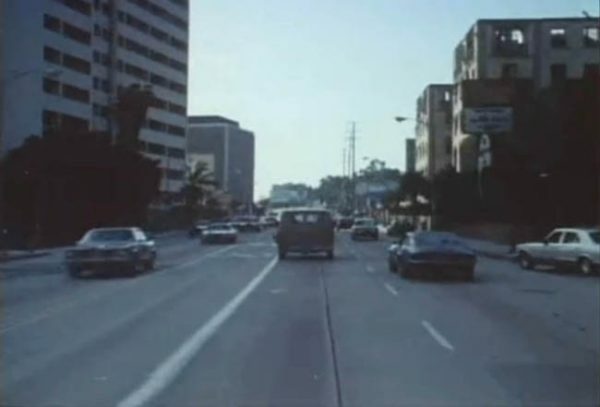 It was part of a complicated transaction in which Goldstone traded the Coronet as partial payment for the commercial block in the southwest corner of Hollywood Boulevard and Highland Avenue – one the most heavily trafficked areas in the city, then and now. At the end of the deal-making, the Coronet ended up in the hands Charles E. Westenhaven. By May 1950 the building was in the hands of KLM Inc. who sold it to Lee Herman and Victor S. Herman for $275,000. It was sold again two years later by “a group of owners” to Mr. and Mrs. Isidor Tumarking for $280,000. In early 1961 the Coronet was purchased for $375,000 by a couple of local heavyweights – Saul Pick and Frank Sennes. Pick was a Hollywood real estate developer who in 1963 would build both the Cinerama Dome and Gene Autry’s Hotel Continental on the Sunset Strip, which is now the Andaz. 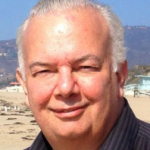 Frank Sennes was the impresario behind the Moulin Rouge nightclub on Sunset Boulevard in Hollywood. He had recently bought Ciro’s, the nightclub next door to the Coronet. “We didn’t have much trouble keeping it full,” Sennes recalled in a 1983 with the Times,“For a time there were a lot of hippies. But we were fortunate to always get good young people.” Sennes decided to renovate the building in the late 1970s. He had evicted all the tenants and started work on the interior but had a change of plans when an offer came in to buy the building for $1 million. Sennes readily accepted the offer. Stewart and Monzio spent an additional $1 million renovating the interior, but progress stalled in October 1980 when the partners came to an impasse over money. After their lawsuits were settled, Stewart put the building up for sale for $4.2 million. There were no takers. The neighborhood had turned a bit sketchy at the end of the ‘70s. The Strip’s eastern leg – the once exclusive Hacienda Park section – had become riddled with street crime. The Coronet stood vacant and boarded-up for several years. Prostitutes and drug dealers routinely conducted business in the building, which had become a haven for transients and a bit of an eyesore. One afternoon in April 1982 Rod Stewart, his three-year-old daughter Kimberly and his secretary were robbed by a gunman during a routine visit to the building. He relieved them of their cash, took Stewart’s car keys and made his getaway in Stewart’s black 1977 Porsche Carrera, said to have been worth $50,000. Rare photo showing the burned out roofless shell of the Coronet after it burned in 1983. While the Conservancy’s application was under consideration, disaster struck. On the evening of July 18, 1983 someone set fire to the interior of the building. Despite firefighters’ efforts – it took an estimated 1.5 million gallons of water to put out the fire – the building’s roof was destroyed, as were walls and flooring on the upper floors. There was smoke damage throughout the remaining structure. Fortunately, the ornate concrete shell of the building remained intact. Investigators found three different ignition sites and signs that an accelerant, probably kerosene, had been used to start the fires – a clear sign of arson. Damage was estimated at $1.5 million. Despite the extensive damage, Westcap was still interested in buying the building. The company promised to try to save the façade, but made no guarantees. The error was picked up again the following year in a July 8 article on Westcap’s purchase of the building for $2 million. The article also noted that, thanks to the advocacy of the Los Angeles Conservancy, the building had been granted an easement and would be saved. Westcap committed to spending $3 million on the renovation, but abandoned plans to convert it into a hotel. It would become an office building instead – to be called the Piazza del Sol. The correction went unnoticed and the building’s historic name was officially listed in the National Register as Hacienda Arms. The misidentification demonstrated how completely the Hacienda Park neighborhood – which the Times itself had once described as “Hollywood’s most exclusive residential section”– had been erased from the collective memory. Piazza del Sol opened on Nov. 24, 1985, with a champagne reception. Interestingly, the article covering the event in the Times stated the correct original name of the building. 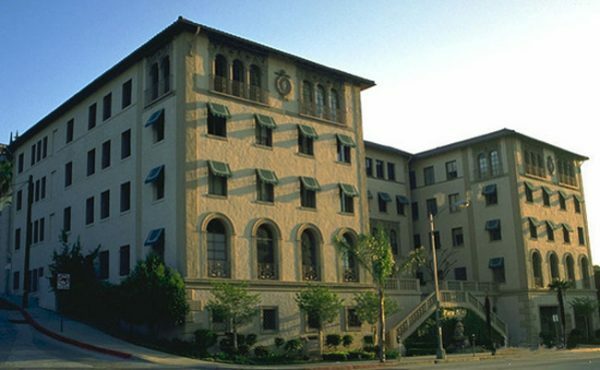 “Once also known as Hacienda Park Apartments, the Italian Renaissance-style building was constructed in 1927 as a luxury apartment house.” The Piazza del Sol attracted A-list Hollywood business tenants, including talent agencies and production companies like Miramax Films and Seven Arts Entertainment. Ten years later Piazza del Sol was purchased by the Mani Brothers Real Estate Group, the current owners. In 2002 – in the first-floor space that was once the apartment where dress designer Paul Ivar Wharton was murdered in April 1935 – the restaurant Katana opened, earning the Piazza a spot on the Los Angeles culinary map. It would be fitting if the new hotel were to use the building’s original name: The Hacienda Park Hotel has a nice ring to it. The historic Hacienda Park Hotel sounds even better. What a great story. Thanks for the trip down the history of this neighborhood joint. Another amazing story! Thank you Jon.